An artichoke can be an intimidating vegetable. Not only does it’s spiky appearance make working with it seem daunting but it can be tough to know where to begin when making an artichoke. What parts are edible? What is the best way to prepare an artichoke? And what is an artichoke anyway? This article will help you answer a lot of those questions and, most importantly, teach you how to make the best Italian stuffed artichokes around. The artichoke is actually a species of thistle, the edible part of the artichoke plant is a flower bud which is picked before it has a chance to bloom. The plant can grow up to six feet tall with the edible bud being about 3 to 6 inches wide. 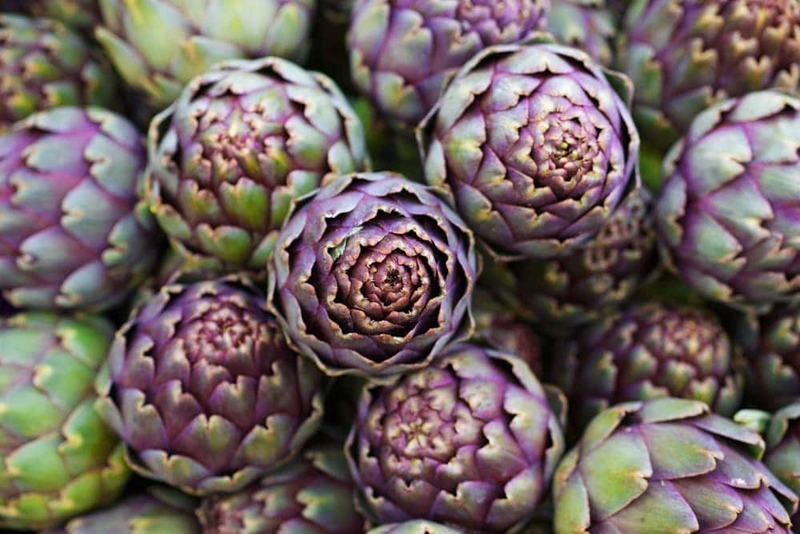 The edible portion of the plant is mainly the fleshy, lower parts of the bud, which are also called the artichokes heart, and the florets in the center which is known as the ‘choke’. Once the artichoke flowers, it is inedible. Artichokes are native to the Mediterranean region and have been referenced in literature from the 8th century BC. The plant has records of being used as food by the ancient Romans and Greeks. Artichokes are still widely popular in Italy and have become one of the countries primary vegetables. Depending on the region in Italy you are in, you are likely to find numerous versions of artichokes. From roasted artichokes to fried artichokes, artichoke sauce to artichoke frittatas, they are everywhere! However, the most popular method of cooking artichokes is to stuff them. Stuffed artichokes are a very common food in Italy and, while the recipe for Italian style stuffed artichokes may vary from place to place, the main idea is the same no matter where you go. Filled with breadcrumbs, garlic, oregano, parsley, cheese and meat, the mix is pushed into the artichoke before being cooked. So let’s take a closer look on how to make stuffed artichokes. To prepare a stuffed artichoke, you must first rinse it and trim it (like many vegetables!). Wash the artichoke under cold water and, as the water is running, tug on the leaves slightly to pull them apart and loosen the artichoke. Separating the leaves will give more space for the filling later on in the recipe. Once cleaned, trim the stem of the artichokes so that they will stand upright when on a flat surface. 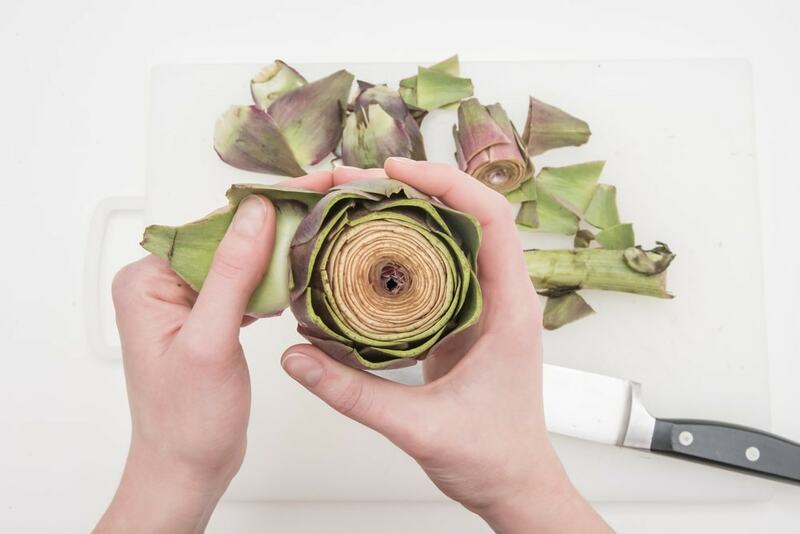 Cut also the tips of the artichoke leaves to make the meat easier to eat after cooking. A quick and easy way to do this is to use a pair of scissors and snip the tops of each leaf one by one. Then remove the center of the artichoke. Use a melon baller or small spoon to scoop the lighter, fuzzy leaves out. You can discard these, as they are not as tasty as the other parts of the artichoke. If you are making stuffed artichoke hearts, you will not need to do as much preparation. Artichoke hearts are smaller as they are the center, base of the artichoke plant. Imagine removing all of the leaves and using just the bottom of the artichoke- that is the heart! The hearts are easier to eat as the whole part is edible while portions of artichoke leaves are inedible. Stuff he hearts in the same manner as you would a whole artichoke. Every Italian will have their own recipe for stuffed artichokes however, to get as close as possible to nonna’s stuffed artichokes, we will stick with the basic, high quality ingredients. Breadcrumbs, parmigiano reggiano cheese, pecorino romano cheese, parsley, garlic, pepper and olive oil are the standard ingredients that every stuffing mix will have in it. Stuffed artichokes with meat will have either sausage, pork or beef cooked and mixed into the breadcrumbs. It is common to see pine nuts in the stuffing as well but these are all variations of the authentic, simple Italian stuffed artichokes. After the stuffing is mixed together, it is placed in between each of the leaves of the artichoke and the center is filled in completely. Many choose to overflow the stuffing or to sprinkle some grated cheese on top before cooking as well. Tweak the recipe as you like! There are two main ways to cook stuffed artichokes. The first method is to make steamed stuffed artichokes. Place the artichokes, standing upright in a steamer basket over simmering water. Cover and steam for about an hour to an hour and a half depending on the size of the artichoke. If using this technique, you may need to periodically add more water to the steamer to ensure the pot does not burn. 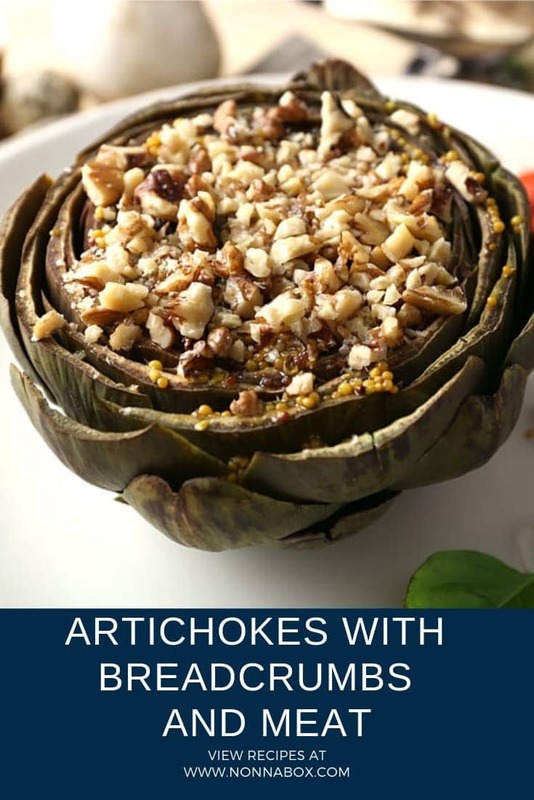 You can also steam the artichokes in the oven by lining them up in a baking dish, adding about a half inch of water, covering with foil and baking for an hour or so. To make baked stuffed artichokes, you should steam or boil the artichokes first before stuffing them. This will cook the vegetable all the way through and ensure the meat is nice and soft. After stuffing the steamed artichokes, line them up in a baking dish and bake until the breadcrumbs and cheese are golden brown. Once you have created beautiful stuffed artichokes, how exactly do you eat them? Well, let me tell you how to eat stuffed artichokes- it’s simple! Begin by peeling away the outer leaves and pulling them, one at a time, away from the base. The breadcrumb stuffing will stick to the leaf so no need for any kind of dip! Place the base of the artichoke leaf (the lighter colored part) in your mouth and use your teeth to pull away the meat of the leaf. Discard the remaining petal. Stuffed artichokes are an Italian specialty and their popularity has only grown over the centuries. Now it is time for you to make amazing, easy stuffed artichokes that you will be sure to enjoy. Get ready to make this recipe all the time- you will be craving it! Serve them alongside this easy chicken marsala recipe for a full meal deal! 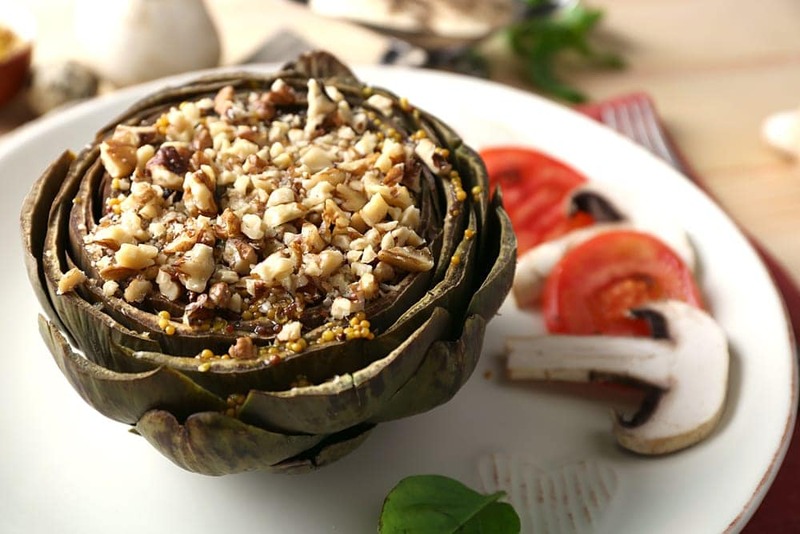 Artichokes are an important ingredient of the Italian cuisine, make this simple Italian stuffed artichokes recipe to impress your hosts for your meal. Rinse artichokes well and tug leaves to loosen slightly for stuffing. Trim off stems so artichokes will sit upright. Trim off the pointed tips of each leaf using a knife or scissors. Place prepared artichokes in a baking dish. Add the oil until the crumb mixture is moistened enough to stick together. Stuff each leaf of the artichoke, starting from the bottom and working your way around, with crumb mixture. Fill each artichoke until you are out of stuffing. Fill the bottom of the baking pan with 1/2 to 1 inch of water. 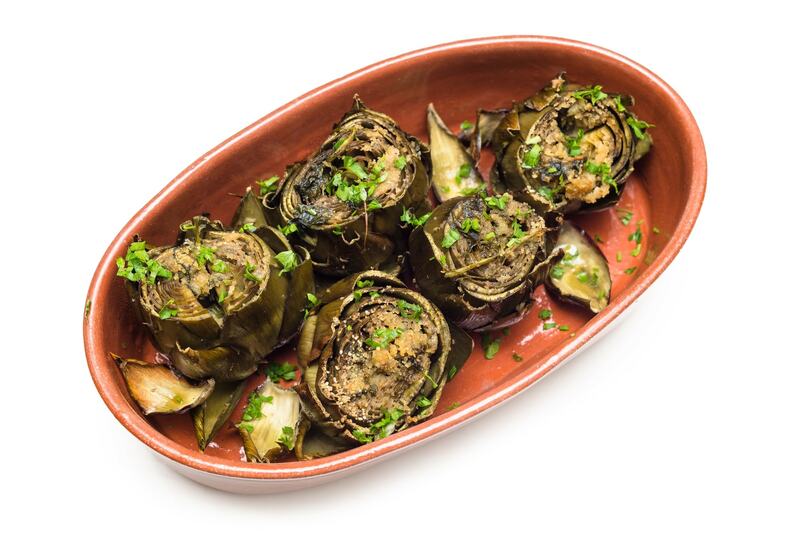 Drizzle olive oil over top of stuffed artichokes and cover tightly with heavy-duty foil. Cook on 375 degrees for approximately 60-80 minutes (depending on size of artichoke) or until leave come off easily when pulled.